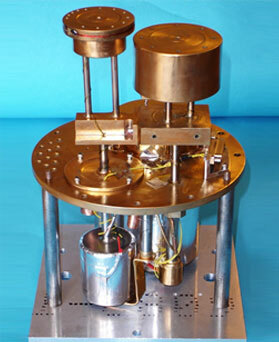 Miniature sub-Cooler working at temperatures between 100 milliKelvin to 1 Kelvin, and designed to meet the needs of a wide range of applications. Simple, low-cost and easy to use. Helium 4 coolers typically achieve base temperatures as low as 800 mKelvin, hold times in excess of 12 hours, and can work with heat loads of up to 1 milliWatt at run temperatures less than 1 Kelvin. The small 4He system was designed to operate with a base temperature of 850 mK, hold time of 12 hours and heat load of 100 microWatts. A larger system will operate with a base temperature of 950 mK, hold time of 12 hours and heat load of 1 milliWatt. We will advise on how your particular requirements can be met with this technology. Our customers' applications for these coolers include quantum computing, superconducting electronics and semiconductor wafer testing. Under no load, the 3He ultra-cold head will run at about 260mK. We make a wide range of 3He coolers to meet customer requirements. The base temperature, hold time and heat load will dictate how much 3He gas the cooler needs to contain. and hence the price. For example, a CRC Helium 7 cooler typically contains between 1 and 5 litres STP of 3He, whereas a Helium 10 cooler requires typically 7 litres STP of 3He. Our prices are quoted both with and without the cost of the 3He included. Some of our customers are able to obtain supplies of 3He at preferential (e.g. academic) prices and hence may prefer to supply their own 3He rather than buy from CRC. CRC coolers will work either within a 'wet' dewar system cooled using liquid cryogens, or with a 'dry' pre-cooler such as a Cryomech pulse-tube system. We will advise on the optimum solution for your application. Systems typically include diode thermometry and wiring to a micro-D connector. Cold-head thermometry (either Cernox or Ruthenium oxide) can be supplied at additional cost, or customer-supplied sensors can be fitted free of charge. Our customers' applications for these coolers include supercooled infrared and microwave sensor technologies, working at the extremes of sensitivity, for example single photon detection. 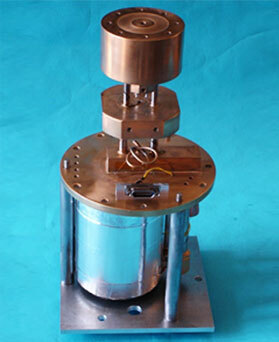 closed-cycle dilution coolers for the sub-100mK temperature region. 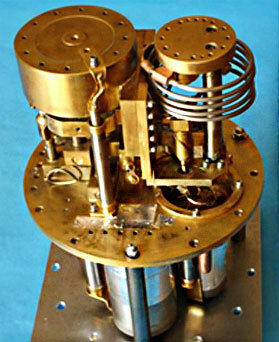 A final-stage prototype system, combining a dilutor with a CRC Helium 7 system acting as a pre-cooler, achieved a base temperature of 80mK when running from a pulse tube mechanical cooler. Further work to optimise the design for buildability and usability is ongoing, with several additional systems now in development, including a dilutor module integrated with a continuous buffer cooler rather than a conventional single-shot Helium 7.